When a healthcare brand is in need of help, a new advertising campaign can do more than just help the brand survive, but it can actually make it thrive. This was the case with the North Shore-LIJ Health System. The New York-based healthcare system ran 21 hospitals and had more than 60,000 employees but was plagued by an ailing name. The healthcare system’s long name had become a challenge to say and made it impossible to remember. Something had to be done to keep the system alive. This led the healthcare organization to take immediate action by taking on a new name, brand promise, and healthcare marketing campaign. AdAge shared more on how the healthcare system now known by the name of Northwell Health was rescued by smart marketing. According to hospital executives, the healthcare system was facing enormous competition and watching many rival organizations open up right nearby. It had become absolutely crucial for the system to make its name, value, and difference widely known among the community in order to bring in patients before they chose to go to a competitor. The only way to distinguish their brand and benefits was by reassessing the way that their brands were being marketed. Soon, the ailing healthcare system started seeking a new name and after reviewing around 600 possible names, they eventually narrowed it down to Northwell Health. The name was chosen because it was easy to say, extremely approachable, and seemed part of common language. In addition to the new name, Northwell knew it also needed a memorable healthcare marketing campaign that spoke to its target audience and would convey the healthcare system’s story in a more engaging and relevant way than any of their competitors. Northwell invested $17 million in the launch of its new healthcare marketing campaign, which was more than eight times the advertising budget that it had the previous year. The ad campaign featured a 60-second commercial welcoming the first baby born at Northwell on the day that the system launched its new name. The ad was seen as a heartwarming, hopeful way to tell Northwell’s story and compare the arrival of their new name to the birth and promise of a new baby. It was a truly unique and compelling way to promote Northwell’s presence. The spot aired throughout the New York market over a ten-day period. 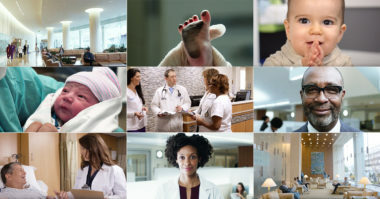 In addition, Northwell ran a series of regional ads highlighting many of their special programs, as well as an anthem ad about the brand’s many innovations. All of its advertising was supported by a paid and organic social media effort. In the campaign’s first six months, Northwell saw 13 million people view its ads online and earned 390 million digital impressions. The system also had an 80% increase in online appointments. Now, the second phase of the campaign is rolling with a new 30-second spot of the baby from the original ad learning to walk amid family and friends. Get a healthier healthcare marketing strategy. Contact MDG Advertising.